Large dogs are held in high esteem for a variety of reasons: for their large stature, their strength, and their protective nature and keen watchdog abilities. If you’re looking for a reliable canine defender, it’s important to consider not only the physical attributes of a dog breed, but its temperament, as well. Criteria used included that the breed must possess a strong watchdog ability and be known protectors. Only purebreds that were classified as being large or giant and to bark minimally were included. Originating in France and bred to be herders and sheep guardians, Briards are independent canines that will get the job done no matter what. Once bonded to its family, they make excellent protectors of the home. Endearingly known as the Tchiorny Terrier or Russkiy Tchiorny Terrier, Black Russian Terriers are working dogs that were not brought to the U.S. until the 1980s. Used in the USSR as military dogs, their watchful nature makes them adept at guarding a territory. Alert, smart and highly sensitive to their surroundings, Belgian Sheepdog have a strong work ethic that stems from their history as herders. They can be aggressive toward strangers and protective of their home and family. Full of energy and intelligent, Belgian Tervurens needs to be tasked with activities to remain engaged. Originally used as herders, this breed has also been employed for search and rescue missions. Rugged and muscular, Anatolian Shepherds are masters at protecting livestock. If necessary they will run down predators. Under their watchful care, these dogs will insure intruders don’t get very far. Although muscular and powerful, American Staffordshire Terriers have a fun-loving and friendly temperament. Highly aware of them surroundings, their alertness makes them reliable watchdogs. With roots as country dogs used to guard farms, Giant Schnauzers later migrated to city life where they worked protecting butcheries and stockyards. These shaggy canines’ protective nature and undying loyalty make them great domestic guard dogs. Despite its name, the Bouvier des Flandres is a hard-working dog used during wartime to pull ambulances and to find wounded soldiers on the battlefield. The Bouvier des Flandres’ protective nature may make them wary around strangers. The majestic Great Pyrenees were originally used to protect sheep. The double claws on their hind legs enable them to climb up the sides of mountains. These sweet-natured giants are loyal and protective to their families and are good for homes with children. Smart, affectionate and charming, German Wirehaired Pointers love to hunt. Humorously known as “The Ugly Dog,” they were once circus performers that traveled with the Ringling Bros. With proper and early socialization, this breed can make great family dogs. An ancient dog breed, some historians believe the Chow Chow may have accompanied Mongolian armies in the 13th century. A sturdy and reliable working dog, they were bred to herd, hunt and guard. Known to potentially be aggressive, with proper socialization Chow Chows can make loyal companions. Originally developed to guard livestock, the Belgian Malinois is commonly used as a police and military dog. Alert and intelligent, these canines make the perfect guard dog. However, without clear and consistent training they, can be wary of strangers and aggressive toward other animals. With their great jaw strength and compact muscle mass, Bull Terriers are not a breed to be reckoned with. Originally developed for fierce bloodsport and to hunt rodents, today these dogs make loyal protectors of their families. The most famous Bull Terrier to date is the spunky Budweiser mascot Spuds MacKenzie. A fierce hunter and protector of the home, the Rhodesian Ridgeback is a no-fuss, sturdy dog. With its powerful back and stamina, it can run up to 30 miles in one stretch. Usually reserved around strangers, this large dog breed is extremely loyal. Built to run, the muscular Weimaraner was originally bred to hunt boars and deer. Over half of its brain is devoted to its highly developed sense of smell. This breed’s alertness and loyal nature ensure it will alert its owners of any suspicious activity. Admired for its sheer size and protective nature, Mastiffs make for excellent watchdogs. Descendants of the Molossus, whose known existence dates to 5,000 years ago, the modern day Mastiff is a sweeter version of its ferocious war dog ancestor. Although loving and fiercely protective toward their families, Australian Shepherds can be cautious around strangers. As high-energy dogs, they thrive best with plenty of exercise and athletic families. With no cattle around, these herding dogs may herd small children instead. 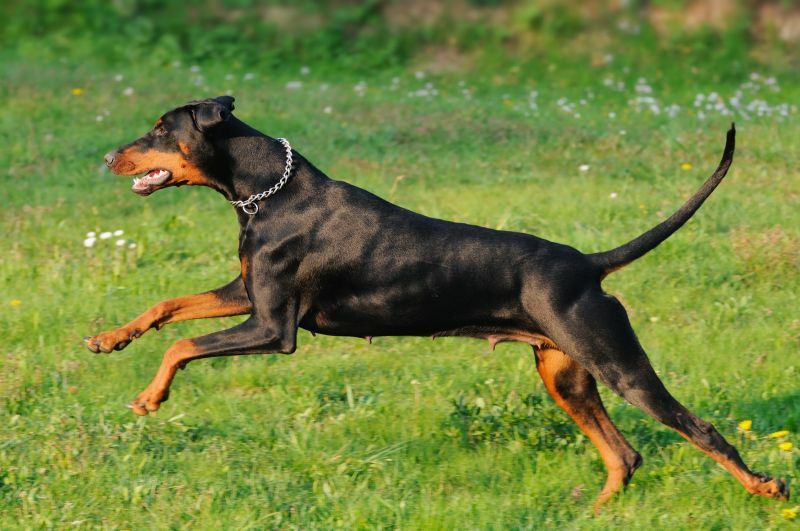 Bred in the late 1900s by a German tax collector to help protect him while he carried money on dangerous streets, Doberman Pinschers were bred to be tough, alert and intelligent. The national dog of France, Poodles are revered for their remarkable intelligence and affectionate nature. Originally used for duck and bird hunting, these beautiful dogs can be seen hard at work in the military. Working dogs that were originally bred to herd sheep, German Shepherds are fearless police dogs often used in search and rescue units. With their fierce bite and high trainability and obedience, the protective nature of this famous breed makes them exceptional guardians of the home.